In a previous post we discussed the importance small business marketing and PR plan, and why you should have one. We went through an overview of the key parts of a plan, and promised you some more in-depth information to help you write your own killer plan. As a quick review, the key parts of your small business marketing and PR include goals, strategy, tactics, key messages, timeline and metrics. Every campaign can use this same structure, whether you are running a business, running for office, or trying to change public opinion on an issue. What are the goals for your campaign? The first part of any small business marketing and PR includes setting your campaign goals. These should be goals that are measurable, demonstrate a business impact, and can be tied back to your campaign strategy and tactics. We like the SMART goal format, which means goals that are specific, measurable, achievable, relevant, and time-bound. This format makes you think through goal-setting in a way that prevents pie-in-the-sky thinking. When setting your goals, make sure you can translate them into business or organizational value. This doesn’t necessarily mean revenue is the only measure to use. In many cases, your small business marketing and PR goal may be to fill your sales pipeline, but your sales team is responsible for translating those leads into revenue. This means that goals might include things like email signups, e-book downloads, leads generated, number of speaking engagements or training attendance. While these metrics by themselves don’t equate to revenue, they prime the pump for future revenue generation. What strategies will you use to reach those goals? Once you have set your clear and measurable goals, the next step is to develop the strategy or strategies for reaching those goals. 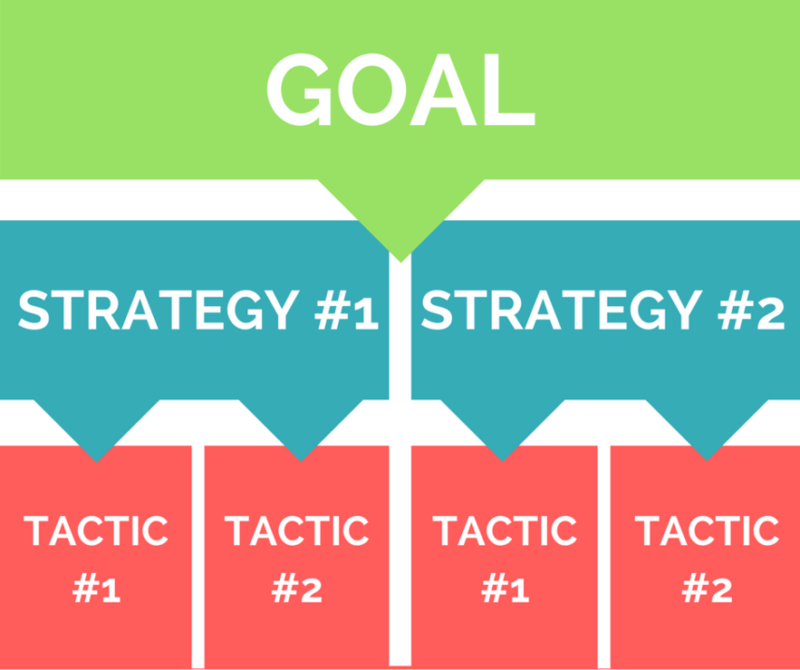 Your strategy is a statement of exactly how you will reach your campaign goals. This is the heart of your small business marketing and PR. A social media campaign to generate leads. Speaking strategies to build thought leadership. Sharing advice and information as part of a content strategy. Driving website traffic through earned media strategy. These are just a few examples to consider. Many campaigns utilize several different strategies, and the important thing to remember is that your strategy must explain how you will reach your measurable goals. Tactics: The stuff that you will do. Unfortunately, just doing stuff without goals and a strategy is like building a house by simply hammering boards together without a blueprint or a tape measure. You’ll build something, but it won’t be what you want. That’s why tactics should be specific to each strategy in your plan. If your goal is to drive 100 leads to your business, and the strategy is focused on speaking and training, then your tactics should be the specific steps you will take to land those speaking engagements or develop and promote those training sessions. If your strategy also included social media marketing, your tactics section would include the specific targeting, messages, timing, platforms and content you will include in that social media strategy. Once you have completed your list of tactics, it’s time to set some dates and milestones for the campaign in part 2 of this series.